Speaking about women in the military, the major question to be answered it whether it is right for women to be a part of the armed forces. This question has been debated about for a long time, but the compromise has not yet been reached. This issue is still argued about by both politicians and common people. The idea of women in the military has been subjected to criticism on behalf of numerous people. There are supporters of this idea, but their quantity is not that significant. Are women suitable for military affairs physically and psychologically? There are a number of pros and cons, and this question cannot be answered straightforwardly. 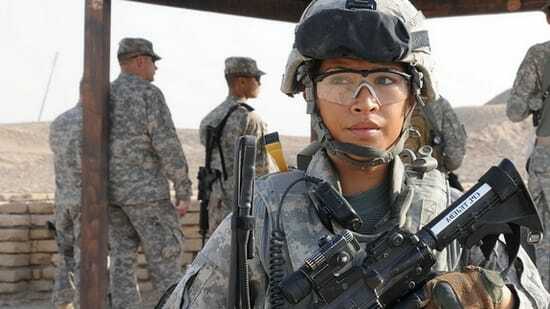 The advantages and disadvantages of women in the military will be analyzed as follows. Among the benefits of women in the military is the fact that disregarding the gender, every person in the military should possess considerable physical and emotional strength. If a soldier has necessary characteristics, it does not matter whether the soldier is a woman or man. There are many cases when soldiers with lack of physical abilities are deprived of a right to fight. Not all men are physically strong, and not all women are physically weak. Furthermore, it is always possible to train women for them to be suitable for military affairs. There are various preparatory trainings that help women become suitable for military roles. What is more, if to speak about the war affairs of the XXI century, it needs to be noted that they are not conducted with the help of swords anymore. Most of the military affairs imply the use of technological advancements. Brutal strength is not the issue. Thus, this proves that women are liable to be a part of the military forces. Among other arguments in favor of women in the military is the fact that women who are going to participate in military affairs are often conscious about the possibility of pregnancy. Women usually take precautions so as not to get pregnant during military affairs. Speaking in favor of this statement, it needs to be noted that not only women can be abused in the military, but men are also under such threat. Thus, it leads to an assumption that it is better for women to be a part of the military, than get abused as captives or prisoners. The arguments in favor of women in the military prove that women have the same rights as men and in many cases it is much better to go out there to protect the country, than be left with nothing else except a fear of bombing or some other negative events that are expected to take place during the war. As for the arguments against women in the military, it is suggested by some people that physically women are not capable to participate in military operations. For this reason, they should be deprived of such a right. In fact, women can never develop enough physical strength so as to be suitable for taking part in military operations. Women remain weak creatures that are likely to be injured during some combats, rather than bring benefit and success to the military operation. Even trainings of women are of no help, as women are physically incapable of actively taking part in military affairs. There are also doubts concerning the efficiency of female soldiers for the military operations. It is suggested that women in the military are associated with excessive spending for regulatory purposes and logistics. This makes women inefficient and unsuitable for military affairs, which is a significant drawback of women taking combat roles. Thus, the problem of women in the military is a highly controversial issue that is still to be solved from both political and civilian perspectives.